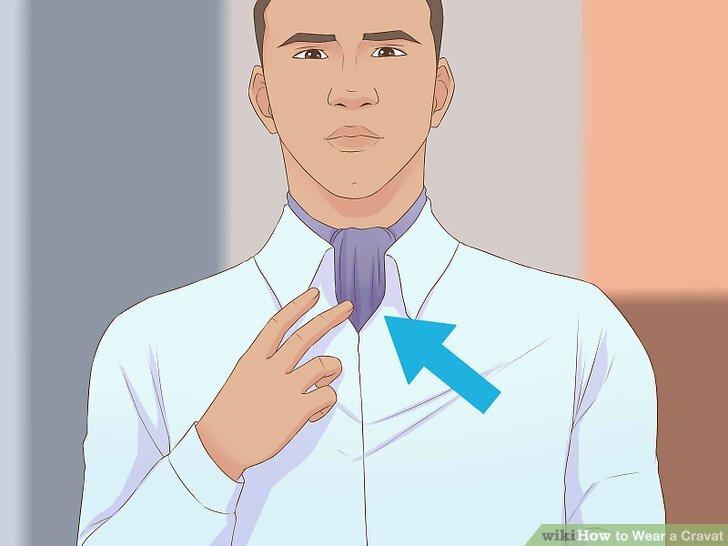 Hang a cravat around your neck so that one end is longer than the other. 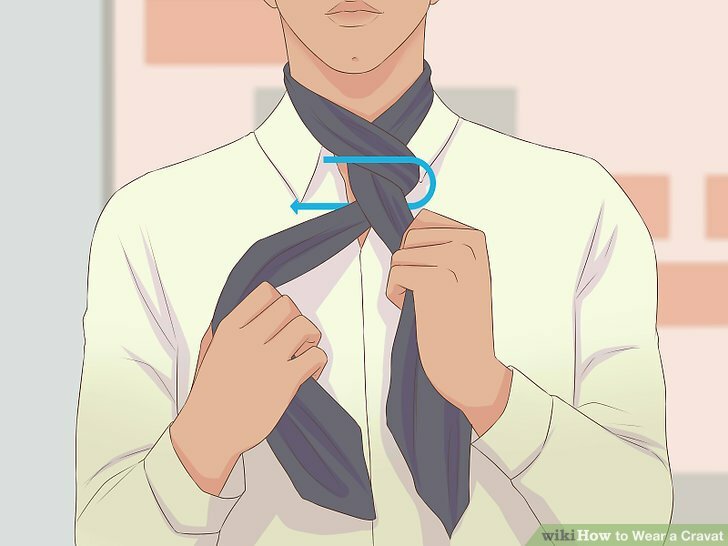 Position the cravat so that it hangs unevenly. One end should extend slightly longer than the other. Consider making whichever end is closer to your dominant hand the longer end to make tying a little easier. Wrap the long end around the short end. 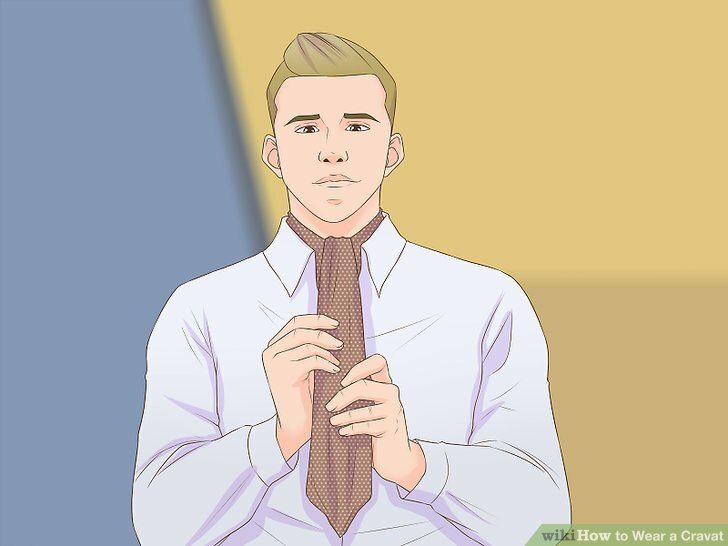 Hold the long end of the cravat in one hand and wrap it across the front of the short end as you hold it tight with your other hand. Continue wrapping the long end around the back of the short end until you have completed one loop. Holding the cravat tightly as you wrap will help make the knot more secure. Wrap it around again, then thread the long end through the neckband. Wrap the long end around the short end again, following exactly the same method as before. As you complete the second loop, thread the long end up through the center of the neckband. 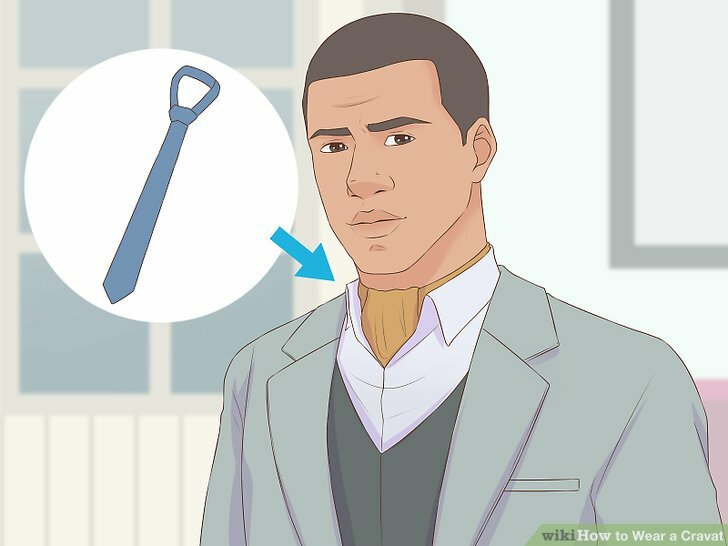 Pull the long end through the neckband just as you would with a regular necktie. Pull the long end down over the front of the loop. Lift the long end up and over the loop once it has been threaded through the neckband. Pull the long end down in front of the loop until it is hanging straight down the front of your shirt. Be careful not to twist the fabric as you pull it over the loop in your neckband or it will not lie flat. Tuck the cravat ends into your shirt or waistcoat. Make sure the fabric is lying flat against your chest as you tuck it in to securely fasten the cravat. 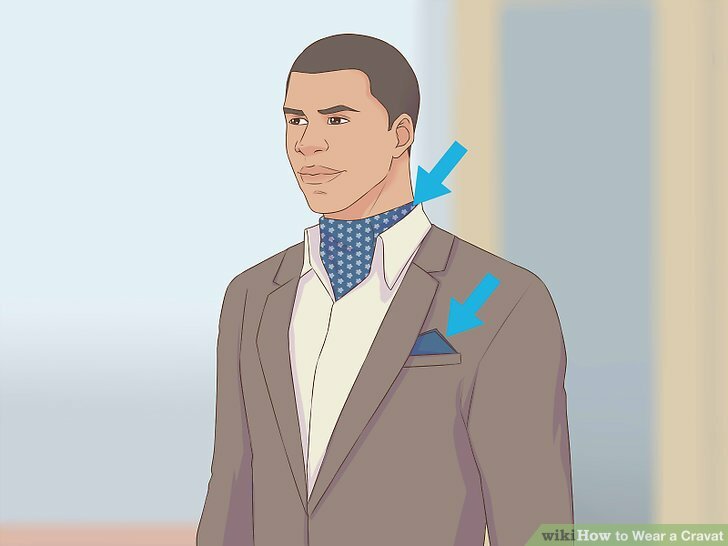 You can either tuck the cravat inside your shirt or wear it on the outside of your shirt depending on the type of occasion you are attending. When attending a formal occasion such as a wedding, wear a formal cravat. Formal cravats are worn on the outside of your shirt and are tucked into your vest or waistcoat. 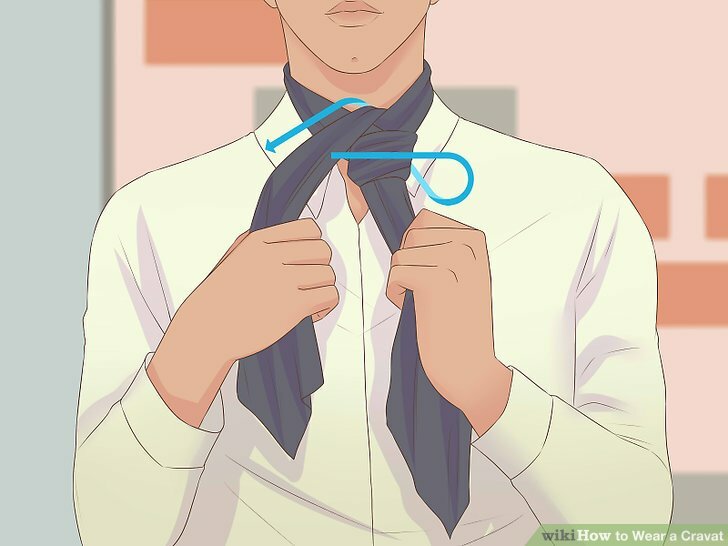 For a casual look, tuck the ends of your cravat inside of your shirt after tying it. Choose a silk cravat to go with a tuxedo. Purchase a silk cravat to wear with a tuxedo at a formal event such as a wedding. 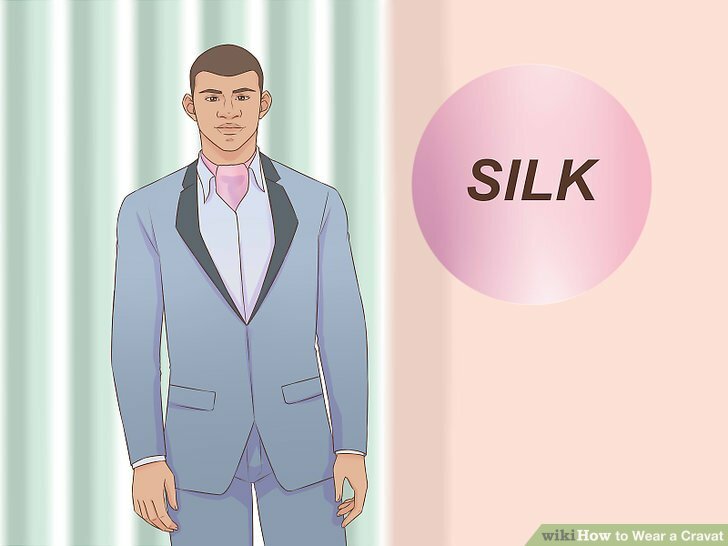 Silk cravats can also dress up an ordinary suit if you don’t have a tux. Silk is a very delicate fabric so make sure to treat your silk cravat with care by following any specific cleaning instructions. Purchase a polyester cravat for everyday wear. Choose a cravat made of polyester that can be worn for everyday activities. Polyester cravats are more durable than silk and will hold up better to frequent wear. 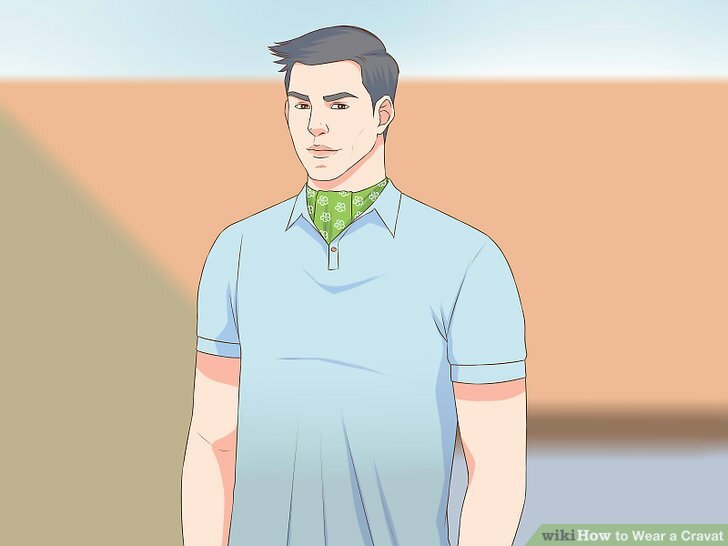 Purchasing a polyester cravat doesn't mean you have to compromise on comfort. Most polyester cravats are just as soft and comfortable as silk! Due to the nature of the fabric, polyester cravats can also accommodate a wider range of printed or woven designs than silk. Match the color of your cravat to your vest. 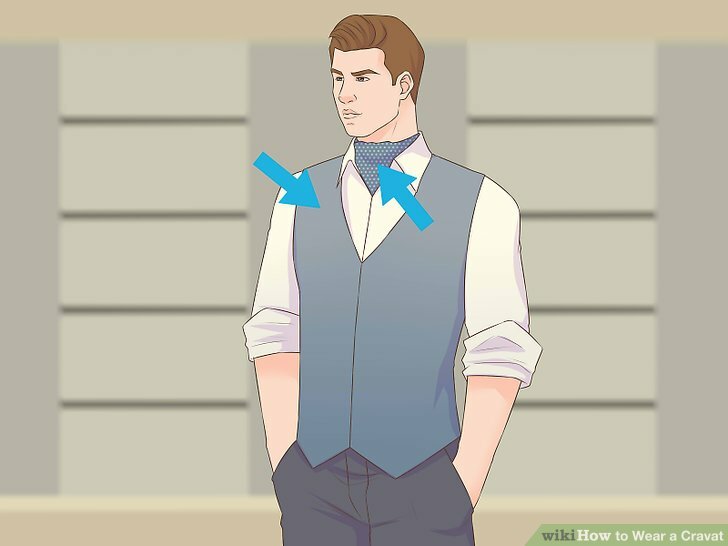 Wear a cravat that matches the color of your vest or waistcoat if you are wearing one. Choose a solid color for a formal look or consider a very subtle pattern. If you are attending a wedding, consider choosing a color that matches the theme of the event. Choose a patterned cravat to add visual interest. Select a cravat with a pattern like paisley for an elegant look to dress up any casual outfit. Consider wearing a striped cravat for a classic look. Avoid selecting a patterned cravat that might clash with your shirt or suit. 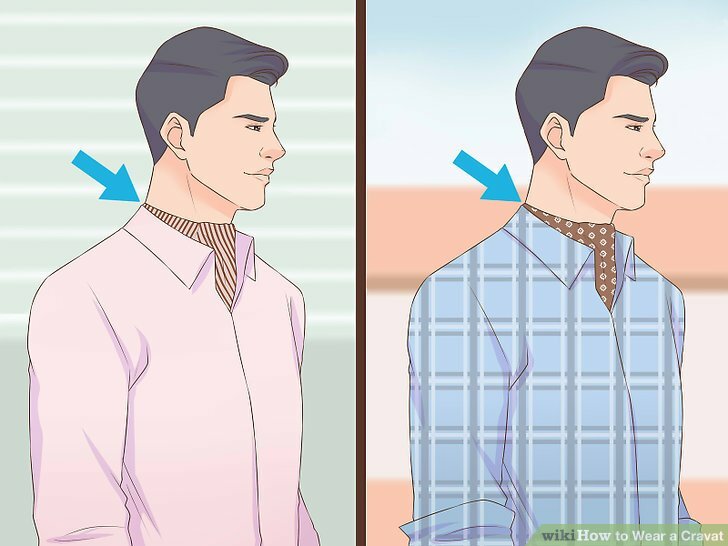 If your shirt has a pattern, consider wearing a cravat with a single color. Match your cravat with a pocket square. Consider coordinating the color and pattern of your cravat with a pocket square placed in the pocket of your suit jacket. Match the colors exactly or choose a complimentary color to create a coordinated look. Pocket squares add extra style and interest to an ordinary suit. Swap a tie for a cravat with a business suit. 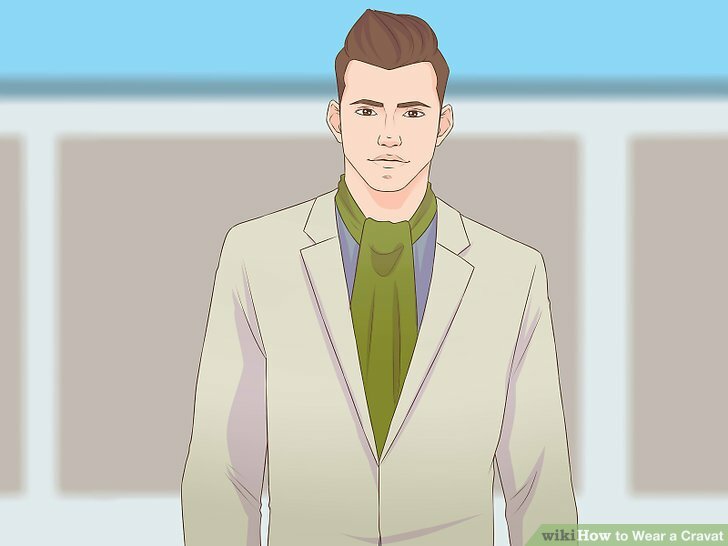 Complete your business look with a cravat rather than a necktie to add a unique style that will set you apart. Cravats are a less common accessory and a great way to add interest to a plain business suit. Cravats are worn more loosely around the neck than ties and are a cooler option during warmer months. Add a cravat to a casual polo shirt. Dress up a casual polo shirt with a plaid or floral cravat to add an extra dose of style. Tie a casual cravat and tuck the fabric inside the front of your polo shirt. Un****on the first few ****ons of the polo shirt to expose more of the cravat. 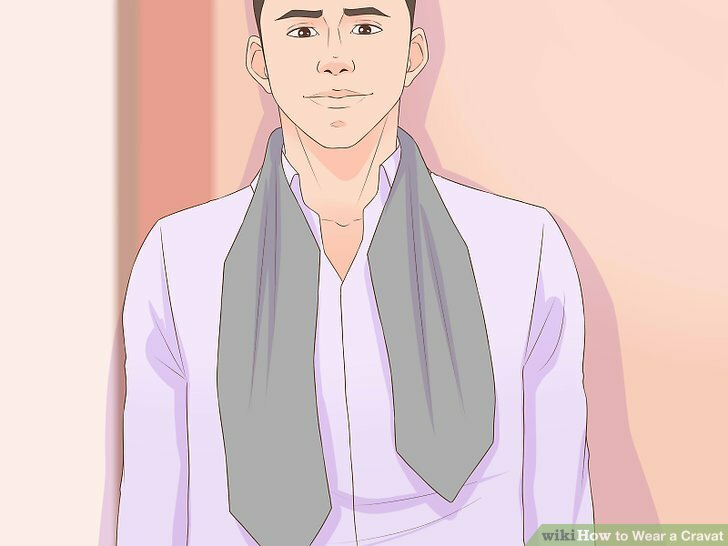 Wear a cravat untied around your neck like a scarf. Layer a cravat with a sports coat or blazer and allow it to hang untied around your neck for a relaxed look. 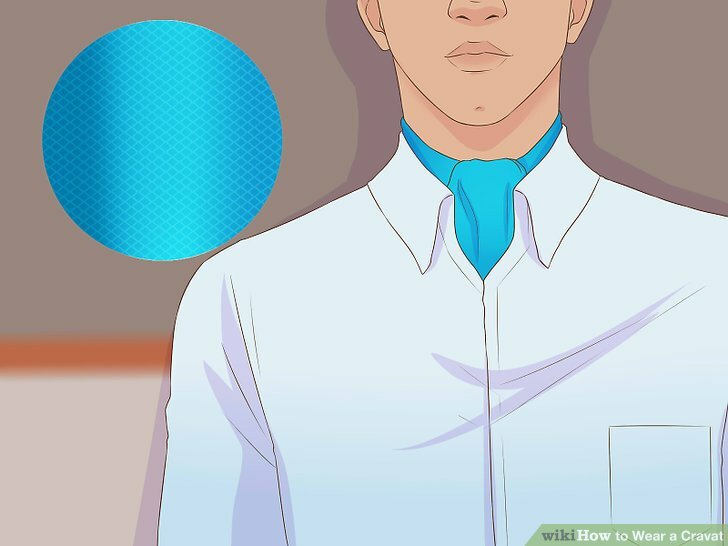 The cravat will create visual interest by adding a unique texture and color to your outfit. For a dressier look, wear a collared shirt underneath your sports coat and cravat. For a more relaxed and edgy look, pair a casual t-shirt with your sports coat and cravat.